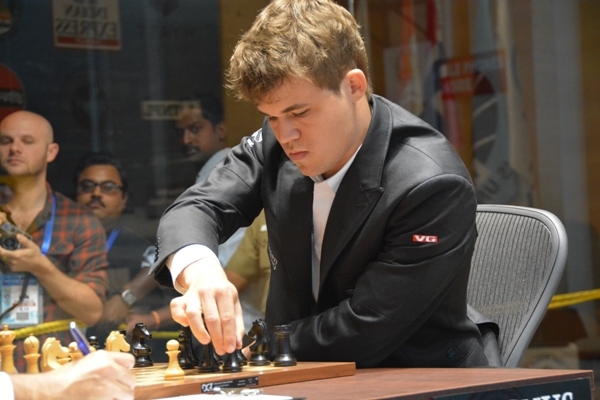 World Champion Magnus Carlsen will visit Brazil from 4th March to participate in the 13th Torneio Aberto Internacional de Xadrez “Festa da Uva” in Caxias do Sul, IM Dragan Stamenkovic of Ponto do Xadrez confirmed for Chessdom. The first event will be a blind simul with visually impaired players on 6th March, followed by a lecture. Next is a 4-player knockout tournament with Semifinal on 6th March and Final on 7th March. His opponents will be Grandmasters Gilberto Milos, Rafael Leitao and Andres Rodriguez (Uruguay). A press conference is to follow after the Final at 16h local. The same evening from 19h Magnus Carlsen will give a simul with 35 players. The seats were sold out within half a day despite the price of 130 EUR! On 8-9th March Carlsen will play in the 13th Open Rapid Tournament. The tournament format is slightly unusual, but already applied in 2010 and 2012 when the guests of honour were Vassily Ivanchuk and Judit Polgar. The first two rounds will be played with the time control 16 min per player. Rounds 3-4 will be played with the time control 30 min per player. Rounds 5-9 will be played with the time control 60 min per player. In the last two rounds (8 and 9), draws will not be possible! In case of a tie, an Armageddon game will settle the score. The organizers are expecting around 400 participants from the whole country. Already 80 players are signed in, with 14 Grandmasters among them.